News — Promised Land . An award-winning documentary, PROMISED LAND, a social justice film on the Duwamish and Chinook tribes, their fight for restoration, and what the federal recognition process says about indigenous sovereignty today. 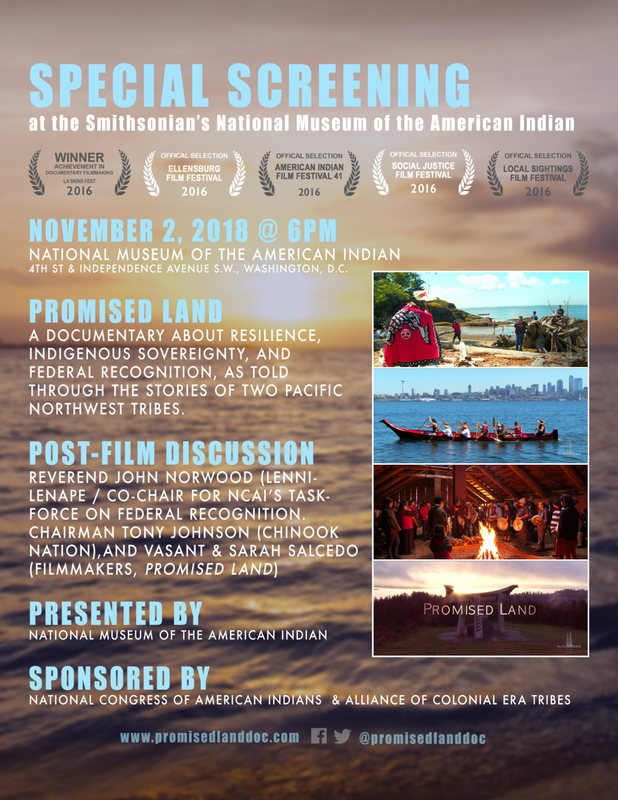 The film will be screening in Washington D.C. at the Smithsonian’s National Museum of the American Indian on November 2, 2018 at 6:00 p.m. in the Rasmuson Theater. The event is free and will be followed up with a panel discussion between Rev. John Norwood (Lenni-Lenape, Co Chair of NCAI’s Taskforce for Federal Recognition), Chairman Tony Johnson (Chinook Nation) and the filmmakers. The film is being hosted by the Smithsonian in conjunction with the National Congress of American Indians and the Alliance of Colonial Era Tribes. In October, we will also be screening at Seattle’s City Hall in October 24, 2018 at 6:00 p.m. - the Bertha Knight Landes Room. Doors open at 5:30, with brief remarks by Seattle City Councilmember Lisa Herbold and Duwamish Tribal Chair Cecile Hansen preceding the film at 5:45. They'll be joined by the filmmakers for discussion with the audience following the screening. The event is free. We have several more screenings this fall to check out on our events page in King, Yakima, and Clark counties in Washington State, and pre-orders for the film are finally available here! © Tall Firs Cinema, 2018. Site designed by Tall Firs Productions.